Anniston basketball coach Torry Brown (R) and mom Sylvie Elston watch as Bulldogs forward Theron Montgomery signs with Marion Military Institute Monday. Philip Stitt’s goal over the next two years is to turn a bulldog into a tiger and not just because that’s the name Theron Montgomery will have across the front of his jersey. 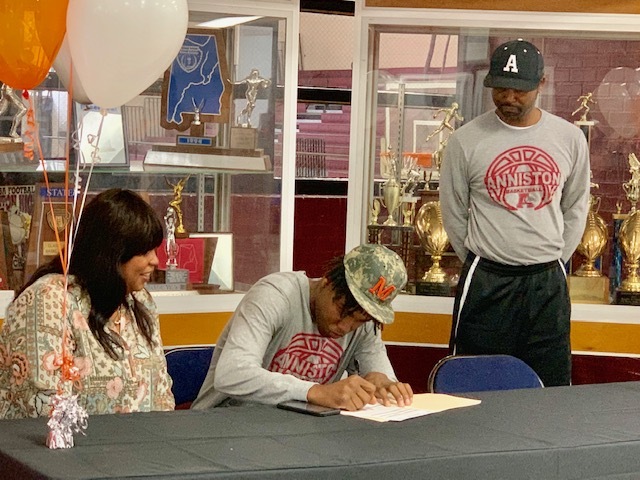 “I told his mom my goal in two years will be to try to make him mad at me,” the Marion Military Institute basketball coach said Monday moments after the Anniston senior signed to play with the Tigers. If he can pull that off – and he’s had some success that way in similar situations in the past – it might just be the best coaching job of his career. Montgomery is the gentle giant in the Bulldogs’ post. “Reserved” is the word most often use to describe his demeanor, but that shouldn’t be misconstrued for timid. If anyone can ever get the aggression out of Montgomery on the floor Anniston coach Torry Brown is convinced the 6-7 center would absolutely dominate. Montgomery has gotten mad a few times. It doesn’t happen often and doesn’t last long, maybe perhaps a possession. There was that time in practice and he was continually getting fouled and missing his free throws got under his skin. And then there was the time last December against Talladega. He was missing a bunch of shots in the first three quarters and his emotional dam finally broke. He chased down a breakaway layup and came out of nowhere to block it into the tunnel and then proceeded to drop 11 points in the quarter. Compared to some of the players he’s been around Montgomery is just starting his basketball journey. He’s only played organized basketball three years, and all of it has been with Anniston. He started out with the junior varsity when he first joined the Bulldogs in Brown’s first season but after the head coach saw him in gym class the next fall following a summer of family-inspired outside work he told the JV coach not to expect having him anymore. Montgomery started for the first time in the middle of that season and has not been out of the starting lineup since. He averaged 12 points and 10 rebounds this past season. Stitt has followed all of his steady development. That shouldn’t be an issue. Montgomery has never missed a practice since he started playing with the Bulldogs. Come next fall the maddening of Theron Montgomery will begin. “I can do it,” Stitt said confidently. “I’ve gotten some really good, quiet guys to get mad at me. Now that just might make him mad.